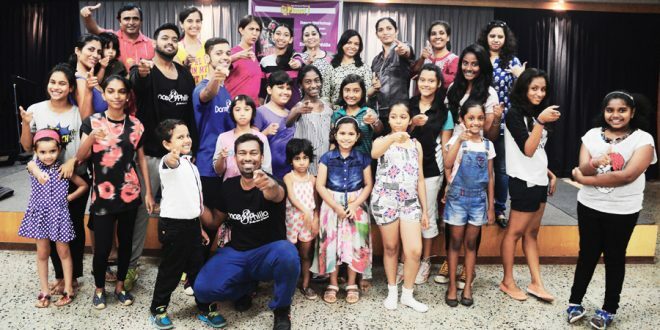 The Navhind Times Planet J’s dance workshop held on Sunday, April 24, gave not just children but also parents an opportunity to unwind, chill and have loads of fun while learning some jazz funk and Latin-based cardio dance steps, along with basic dance coordination and contact improvisation. The theme of the workshop was, ‘Dance to your heart’s content’, and that is exactly what the participants did. Conducted at Dempo House, Panaji, by Dance-o-philia, the three-hour workshop was open to the age group of 10 to 16 and parents too were invited to participate, which they did most enthusiastically! The workshop commenced with Eby John, one of the directors of the group, familiarising the participants with a few jazz dance terms like pirouette, pencil turn, isolations, jazz hands etcetera. From the word go, parents were on the floor along with their children and needed no encouragement to participate. To facilitate flexibility, stretching exercises followed and a few grunts and huffs and puffs could be heard. Once the participants were done with their exercises, they were all set for the basic jazz dance routine that followed. Pirouettes, pencil turns, jazz hands and many other postures were incorporated in this session. While teaching the participants the various steps, Eby also regaled them with his humour and witticism. He made dancing so much fun, that the participants were reluctant to take a break! After the break the half hour zumba session to the beat of songs like, Galla gudiyan and Dollar, had them screaming for more. The hand and leg coordination session not only got everyone laughing but also gave them an understanding of how each body part moves together in tandem/sync with each other. Darryl and Glaven the other directors of the company taught other routines to foot-stomping music and got everyone into the groove and one could feel the excitement and rush as the young and old all sashayed according to the beat. Every single participant could be seen having a super and awesome time. The workshop seemed to end too quickly for everyone present however Eby, Glen and Darryl, took the time to interact with the children and adults present. Due to the summer vacation, the next Planet J workshop will be in June, so keep yourself posted.